The purpose of this annual contest, named in honor of Willamette Writer’s founder, Kay Snow, is to help writers reach professional goals in writing in a broad array of categories. Postmark Deadline: April 19th, 2013. Student Writer (18 or under) – There are three categories of student writers. Students can enter any type of writing, fiction, non-fiction, poetry. Word limit, 1,500 words. Students should not enter adult categories unless paying the adult fee. If a student enters an adult category, do not put student or a grade category on the entry form. Students are limited to ONE entry. There is no fee for student writers in these three grade groups. Students should not enter adult categories unless paying the adult fee. If a student enters an adult category, they should not put student or a grade category on the entry form. 1. Entries that do not follow all category guidelines and rules will be disqualified. 2. Entries must be typed, double spaced (except poetry and screenplays – follow rules below). 4. Type word count on upper right of first page, except for screenplays and poetry. 5. Number each page except first page. 6. To assure confidentiality, Do Not Put Author’s Name On Manuscript. 7. A registration fee and entry form must accompany each entry. Multiple entries can be mailed in ONE envelope with ONE entry form. 8. Each INDIVIDUAL entry must be accompanied by ONE (1) 3 x 5 card with author’s name, address, phone, and title of entry and category. Place the card in a plain white envelope, seal it, and on the outside of the envelope write the title of your entry and its category. For poetry entry, EACH poem must be accompanied by a 3 x 5 card in an envelope. If you submit TWO poems (or more), you must have a 3 x 5 card in a separate envelope for each poem. If you submit two fiction entries, each entry has ONE 3 x 5 card for EACH entry inside ONE small envelope. 9. Submit TWO (2) copies of each entry. If you submit two poems for one entry, submit TWO COPIES OF EACH POEM. Do not send originals. Entries, registration form, and 3 x 5 cards can be mailed in one envelope. 10. All entries must be original and unpublished or unproduced. Screenplays cannot be an adaptation of a published novel or non-fiction book by someone other than the screenwriter. Being posted on a web site is not considered publication, nor is a non-fiction article appearing in an on-line newsletter if there was no payment involved. 11. To receive a list of winners, send a SASE (self addressed stamped envelope). 12. Do not send cash. Send a check, money order, or credit card information with the entry. You may enter more than one category and submit more than one entry in each category. A fee must accompany each entry. 13. Only one prize will be awarded to a winner in any category. 14. Manuscripts will not be returned. Keep a copy of your entry. 15. Submissions will be judged anonymously and judges decisions will be final. Judges reserve the right to withhold prizes in any category if entries do not meet their standards. 16. 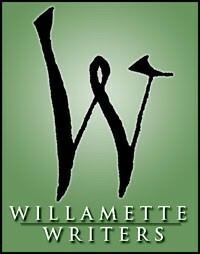 Fee per entry is $10 per entry for members of Willamette Writers and $15 per entry for non-members. Student entries are free. Note: Contest fees are not refundable. Go to the printer-friendly Kay Snow Awards entry form. Students may submit work in any of the many subgenres of creative non-fiction: memoir or autobiography, essay, literary journalism, or profiles of people or places. Submissions may be “conventional” or “experimental” and may represent any creative non-fiction tradition. However, the best work will demonstrate compelling literary merit. Open to high school and college levels. Submissions not falling within the guidelines outlined below will not be considered. Late entries will not be accepted. Entries accepted March 1–April 30, 2013, Noon CST. The writing you upload must include a title, your name, and page numbers within your file. Please use a plain, common, and easily readable font, such as Times New Roman, 11- or 12-point. Accepted file types: .pdf, .doc, .docx, and .txt (maximum file size: 8 megabytes). One winner in each category will receive a cash award and will be an honored guest at the Colony’s National Award Ceremony in New York City in the Fall 2013. Winners will be notified in September. Four finalists in each category will be awarded trophies. Up to fifteen semifinalists in each category will be awarded certificates. Submissions will be read by national panels of teachers and writers. They will be judged by how well they achieve several qualities, including the artful treatment of subject matter; originality; quality of insight, image, voice, and style; artful arrangement of elements and materials; and overall aesthetic, emotional or intellectual effect. Follow these links for the entry form, suggested curriculum and resources, and all peace writing scholarship details. Submissions may be sent by email (preferred) or postal mail, and we recently extended the submission deadline to Wednesday, March 20th, 2013. A panel of judges comprised of noted authors and distinguished community members will select the three winning entries. The first prize winner will receive a scholarship award of $1,000, the second $750 and the third $500. Oregon PSR will host an awards ceremony on Friday, May 3rd at the Ecotrust Building in Portland at which the three winners will be honored. The awards will be given as part of the Opening Reception for the Particles on the Wall art and literature exhibit, which deals with the historic consequences of Hanford and the nuclear age. Students in Grades K-12 are invited to participate. Follow ALL the rules for submitting your work. In every contest we have to disqualify a very large number of very good entries because the writer didn’t follow the rules for submitting his or her work. Don’t let that happen to you. Remember to send your very best work. Have it proofread by someone skilled at writing. Errors can cost you a win. Entries must be original and previously unpublished and include a hero among us, real or fiction. We are seeking fiction and nonfiction short stories, NOT essays. Short stories have a plot, characters, and dialogue as well as a sense of time and place. Give your story a title. We receive hundreds of entries and having a title on your entry helps us identify it. Proofread your work. Proofread it again. Have a teacher or parent proofread it one more time. Send only your best work. Parents of very young writers may transcribe (type) the story for their child. Technical ability must be consistent with grade level. Obvious re-writing by an adult will result in disqualification. Proof reading is not only OK, it’s encouraged. See above. In the upper LEFT corner of PAGE 1 you must include name of author, age and grade level and category (Category 1 = Grades 7-12, Category 2 = Grades 3-6, Category 3 = PreK-2), name of parent or guardian, complete address including street number and name, city, state and zip code, telephone number, and email. We have to be able to contact winners. No Fancy Fonts – No Fancy Formatting – No Colored Text – No Pictures – No Text Boxes. This is a writing contest. We want to see your story written in a normal readable font. Times New Roman 12 is a good choice. Entries containing profanity, violent and/or sexually explicit material are not considered appropriate for this contest and will not be considered. Entries MUST be written in English. Multiple Submissions are NOT allowed. One story per person. Entries WILL NOT be returned. It is important that you maintain a copy for your files. Winners will be announced and prizes awarded 30 – 45 days of close of the contest. Information about the awards will be made public on the Young Voices Foundation Website. 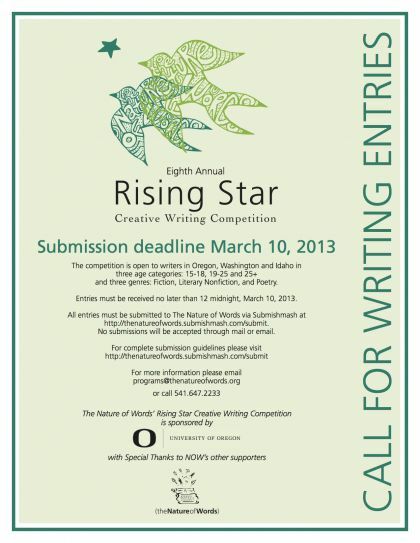 • The competition is open to writers in Oregon, Washington and Idaho in three age categories: 15-18, 19-25, and 25+. • Genres include Fiction, Literary Nonfiction, and Poetry. • Submitting writers who have won in the past may not submit again. • Submitting writers may not have published a first book or chapbook, but may have had individual stories, essays or poems in print. • Poets may submit three unpublished poems (no more than four single-spaced pages, total); prose writers may submit one unpublished double-space piece of no more than 3,000 words per genre. “Publication” includes appearance on any Internet source except a blog. • Use one-inch margins, Times Roman Typeface, and a 12-point type. Submissions must be in Microsoft Word® format. Entries will not be returned. • The authors’ name, mailing address, phone number, email address, genre of submission, age category, and word count must appear on the cover sheet with entry. • Entrant’s short bio should include information about themselves and their interest in writing. Winners, when notified, must submit a photo (headshot preferred) for use in publicity and the annual anthology of student writing. • Entries must be received no later than 12 midnight on the submission deadline of March 10, 2013. • Entries dated after this date will not be read. • For more information email programs@thenatureofwords.org or call 541.647.2233. Winter Break is Coming . . .